On average, a physician will interrupt a patient describing her symptoms within eighteen seconds. In that short time, many doctors decide on the likely diagnosis and best treatment. Often, decisions made this way are correct, but at crucial moments they can also be wrong -- with catastrophic consequences. In this myth-shattering book, Jerome Groopman pinpoints the forces and thought processes behind the decisions doctors make. Groopman explores why doctors err and shows when and how they can -- with our help -- avoid snap judgments, embrace uncertainty, communicate effectively, and deploy other skills that can profoundly impact our health. This book is the first to describe in detail the warning signs of erroneous medical thinking and reveal how new technologies may actually hinder accurate diagnoses. How Doctors Think offers direct, intelligent questions patients can ask their doctors to help them get back on track.Groopman draws on a wealth of research, extensive interviews with some of the country’s best doctors, and his own experiences as a doctor and as a patient. 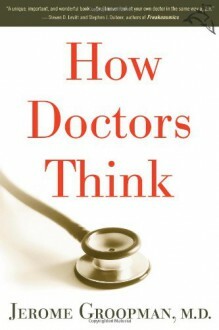 He has learned many of the lessons in this book the hard way, from his own mistakes and from errors his doctors made in treating his own debilitating medical problems.How Doctors Think reveals a profound new view of twenty-first-century medical practice, giving doctors and patients the vital information they need to make better judgments together.